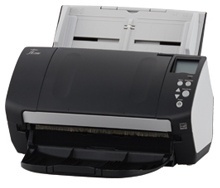 The Fujitsu Document Scanner fi-7160 provides unmatched performance and market-leading document imaging capabilities with faster scanning speeds. Designed for efficiency and built to last, the Fujitsu fi-7160 scanner protects your documents with acoustic sensors, ensures your data is captured with smart ultrasonic technology, and reduces rescans by cleaning up documents automatically in a single pass. Reliability is enhanced even further with new skew prevention technology for exceptional paper handling. The Scannx BookScanner A3 ADF is an integrated automatic document feeder that replaces the lid of either the BookScanner BS 7145 or BS 6167 book edge scanner, and scans documents at up to 45 pages per minute in black and white. 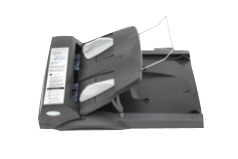 Because the unit rests on top of the book-edge scanner and connects to it via a cable, the BookScanner A3 ADF does not take up any counter/desktop space and provides for the greatest amount of scanning versatility in very limited spaces. The hinges on the BookScanner A3 ADF have a unique spring loaded design allowing the lid to be lifted up with minimal effort and will even hold itself up when opened to make it easier to scan off the flatbed. The BookScanner A3 ADF expands the versatility of the Scannx Book ScanCenter to scan documents in addition to the books scanned on the book-edge scanner. 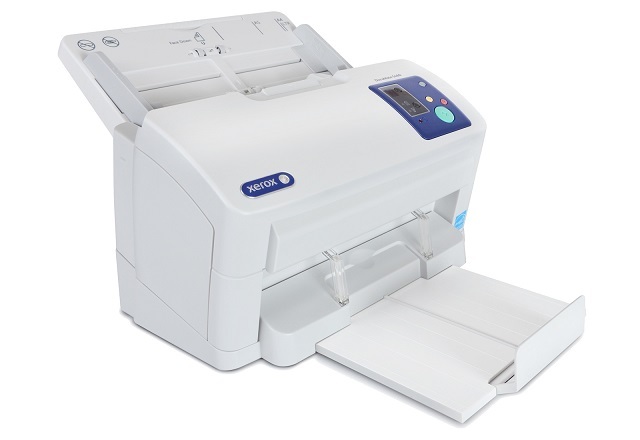 It has a 50 page capacity document feeder and can scan documents up to 11" X 17". The BookScanner A3 ADF's duty cycle is rated at 2500 scans per day and comes standard with a 1-year manufacturer's warranty. Extended service agreements up to 5 years are also available. Maximum document size is 11" x 17"
The Scannx Document ScanCenter is comprised of a Scannx touchscreen PC, a Fujitsu color sheetfed scanner, and the Scannx ScanCenter software. It is the industry's most powerful, and easy- to-use, self-service document scanning solution for library patrons and staff. Scans documents up to 8.5" x 34"
The Xerox DocuMate® 5445 can scan a variety of document types including long, small, thick and thin sheets, as well as student ID cards, drivers' licenses, receipts, and other mixed size documents. The DocuMate 5445 is integrated with the Scannx touchscreen interface to allow users to simply insert a document and press the "SCAN" button on the touchscreen window to initiate scanning. The Scannx software takes over from there, auto-cropping, auto-straightening and auto-orienting the documents. No other book scanning option can scan and convert 50 pages of text into a searchable PDF file format as quickly at this price point.